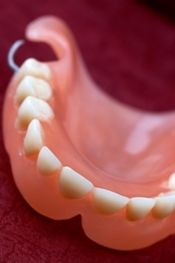 A removable denture is a denture that can be took off by the patient itself, so without professional help. It usually replaces several teeth. It is held in part thanks to the remaining teeth and in part by leaning against the gums and underlying bone. A denture usually takes a few weeks to adapt. Moreover it requires certain retouching as time passes by, because unlike the dentures the mouth is alive and evolve constantly. Thus with time the denture lose its stability and it become necessary to make the new one. Removable complete denture: When there are no more teeth left, they can be replaced by an acrylic resin denture, which has to lean as much as possible against the gums, in other words to follow perfectly the line of gums. Removable partial denture: It is a rigid, metal base denture that is supported by the remaining teeth thanks to the brackets and on the other hand it is leant against the gums. It is more stable than the removable complete denture because it has support of teeth . Removable denture in implants: This is definitely the most stable denture but it requires a certain bone amount that will allow the implant placement. 3 months after the chirurgical placement of implants, the denture is attached via small connectors (button, bar or magnet).